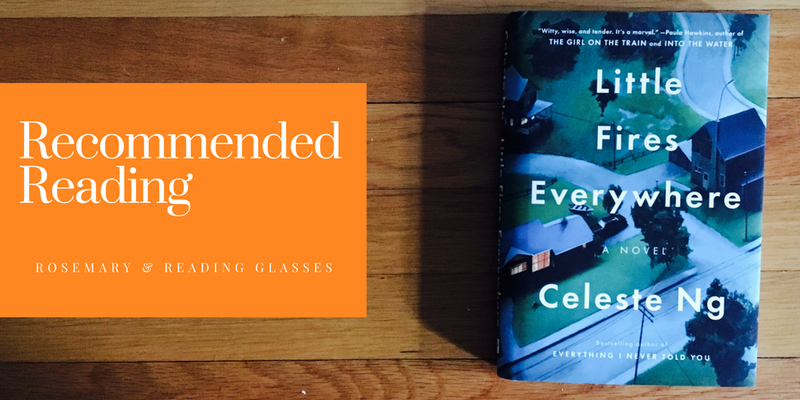 As I read Little Fires Everywhere*, Celeste Ng’s excellent second novel (after the wonderful, heartbreaking Everything I Never Told You), I kept wondering if this is what it feels like for a New Yorker to read a novel set in New York. Little Fires Everywhere is set in Shaker Heights, Ohio, a suburb of Cleveland. Ms. Ng graduated from Shaker High, and I did too, a few years later; I delighted in all the Shaker- and Cleveland-specific detail in the book (The tiny trash scooters! The murals in the high school! The egress! The Lusty Wrench! Yours Truly!). It was almost surreal to know a novel’s setting so well. In the novel and in actuality Shaker Heights is racially diverse, and a sizable contingent of the population is liberal and affluent. But its late-90s talk of “colorblindness” masked (masks) an undercurrent of discomfort when it comes to taking on issues of race and class—discomfort at which Ms. Ng takes careful aim. And goodness, does she ever hit her mark. The Richardson family is the kind of family people tend to associate with the city: Mr. Richardson is an attorney. His wife, Elena (“Mrs. Richardson” for most of the novel, a subtle nod to her need to mark status), her journalistic ambitions thwarted by motherhood and sexism, is a reporter for the Sun Press, a local paper. They have a big house, nice cars, and four children who attend the excellent public high school (no joke, there’s a planetarium). Lexie and Trip are popular kids, set to be successful in the same way their parents are; Izzy, the youngest, has a contrarian streak and clashes most often with her mother. But it’s Moody, the quiet sophomore, who brings Mia and Pearl Warren into their lives. After more than a decade roaming the country, taking odd jobs to finance her art and buying furniture and clothes at thrift stores, photographer Mia decides to settle in Shaker with her daughter Pearl. They rent the second floor of a duplex owned by the Richardsons, and when Moody rides his bike over to have a look at the new tenants, he and Pearl become friends. Over time, the two families intertwine in subtle ways, but the precarious social balance they’ve struck is upset when Cleveland is gripped by the case of little Mirabelle McCullough/ May Ling Chow. The baby was left at a fire station by her mother, Bebe, and taken in by the McCulloughs, a Shaker couple desperate for a child. When Bebe Chow appeals for help to get her baby back, the resulting furor puts Mia and Elena, already separated by class and lifestyle, on opposite sides of the bitter debate, with disastrous consequences. The conflict gives us a window into how structural inequality can separate a mother from a child, how white people who consider themselves liberal find their sensibilities shocked (and fight back) when one of their own is threatened, how comfort constrains compassion. What would she have done if she’d been in that situation? Mrs. Richardson would ask herself this question over and over [ . . .] Each time, faced wth this impossible choice, she came to the same conclusion: I would never have let myself get into that situation, she told herself. I would have made better choices along the way. 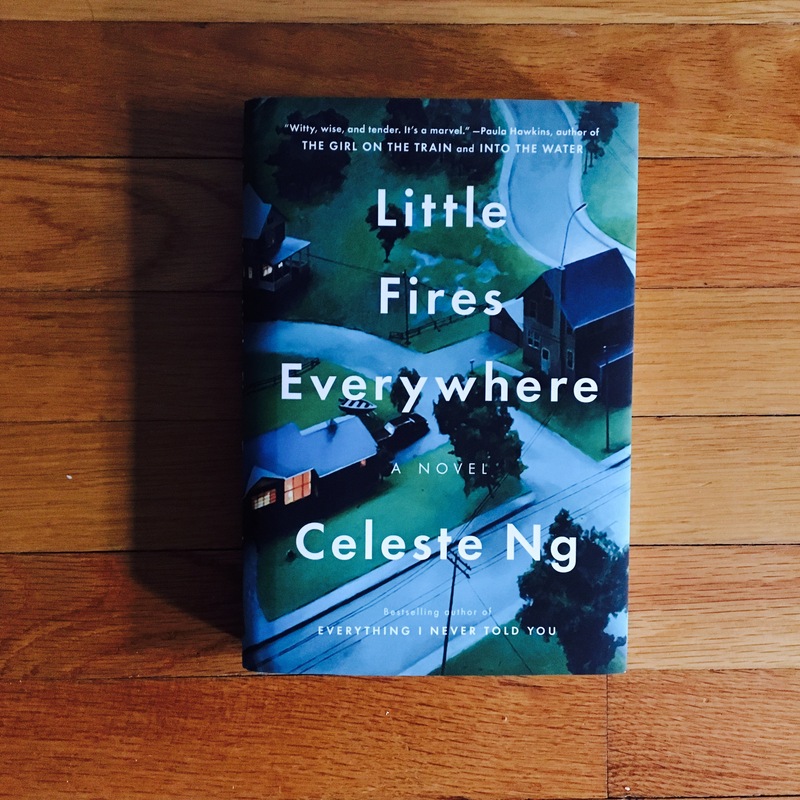 The strengths of Little Fires Everywhere are numerous, from its seemingly effortless prose to its command of more than half a dozen nuanced character arcs. Ms. Ng captures the insecurities of teenagers and adults with humor and sympathy; her characters make poor decisions, certainly, but we always understand why. I loved this book about motherhood, privilege, art, and impossible choices. Highly recommended. I’m hoping to finish this today! Great review! I’m so glad to hear her second one is as good as her first. Can’t wait to read it! It’s fun reading books set in familiar places, isn’t it? I heard an interview with the author on NPR recently and immediately thought of you. Your detailed review makes this book sounds very interesting. I plan to read it. Thanks! I enjoyed Everything I Never Told You, although I also thought it was a little over-hyped. I’ve been wondering about this one. Thanks for a good review. Still have her first book in my TBR stack so really should read that first but your review tempts me to go straight for Little Fires! OMG. Ordering as soon as I can.The trash scooters! I finally read this book, and I liked it better than Ng’s first one. It was really good.